Empathy is defined as a sign of emotional intelligence, an emotional ability which helps people understand other peoples feelings as if they were their own feelings. In other words, empathy is the ability to put yourself in someone’s shoes. Empaths are highly sensitive, finely tuned people when it comes to emotions. They feel everything, sometimes to an extreme degree. Empaths absorb other peoples emotions and sometimes physical symptoms because of their high sensitivities. When an Empathic becomes overwhelmed by the impact of stressful emotions they may experience panic attacks, depression, chronic fatigue, anxiety and many other physical symptoms that defy traditional diagnosis. Empaths are naturally giving, spiritually open and good listeners. 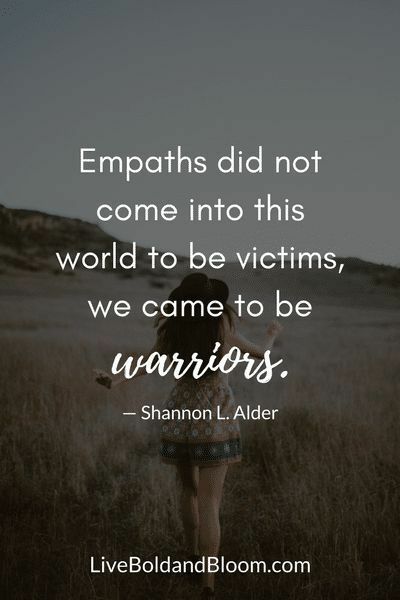 If you want heart, Empaths have got it and through thick or thin these people will be there for you. But they can easily have their feelings hurt too. Empaths are often told that they are “too sensitive” and need to “toughen up”. Empaths take on negative emotions from other people which can be exhausting for them. Empaths become overwhelmed by crowds, which can amplify their empathy. They tend to be introverted and prefer one-to-one contact or small groups. Empaths experience the world through their intuition. This helps Empaths find positive relationships and avoid energy vampires. Empaths crave time alone, they find being around people can be draining so they periodically need time alone to recharge.